Mark and Logan, originally uploaded by Lukasmummy. Credits: Layered template (Freebie 52) by Chrissy W and January Love by Jewel Goodwin (Mad Genius Designs). Font is Staccato222 BT. Quote reads: I love men in bed when they are sleeping. But then they have to go and wake up. Daphne Zuniga. Slide, originally uploaded by Lukasmummy. 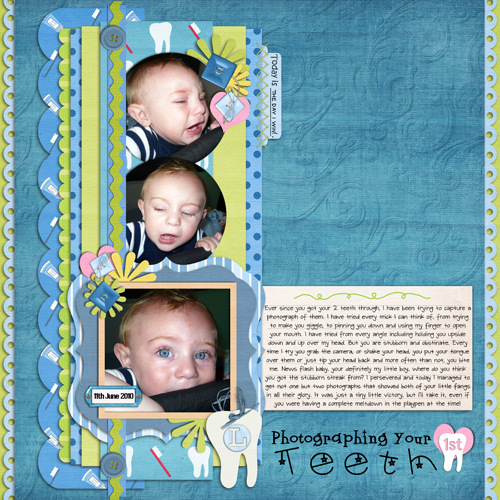 Credits: Layered template (Stackables Set 1, Template A) and I’m All Boy by Jen C Designs. Font is Pea Ink and Post by Amanda Bottoms (Fonts For Peas). 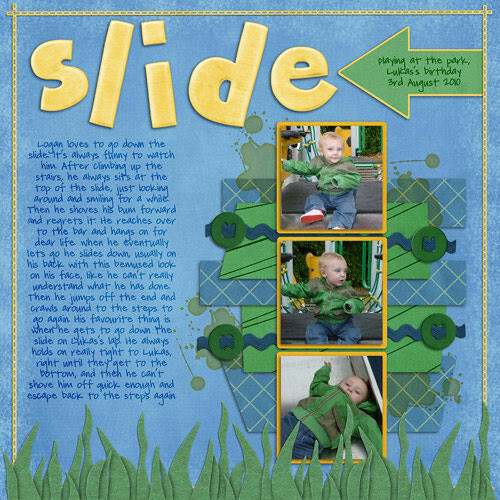 Journalling reads: Logan loves to go down the slide. It’s always funny to watch him. After climbing up the stairs, he always sits at the top of the slide, just looking around and smiling for a while. Then he shoves his bum forward and regrets it. He reaches over to the bar and hangs on for dear life. When he eventually lets go he slides down, usually on his back with this bemused look on his face, like he can’t really understand what he has done. Then he jumps off the end and crawls around to the steps to go again. His favourite thing is when he gets to go down the slide on Lukas’s lap. He always holds on really tight to Lukas, right until they get to the bottom, and then he can’t shove him off quick enough and escape back to the steps again. Photographing Your 1st Teeth, originally uploaded by Lukasmummy. Credits: Layered template (Cindy’s Templates Set 28, Template 2 and Nothing But The Tooth by Charm City Scraps. Fonts are CK Solid, CK Stensa, CK 8 Ball, CK Journaling, CK Nitelite and CK Stars. Journalling reads: Ever since you got your 2 teeth through, I have been trying to capture a photograph of them. I have tried every trick I can think of, from trying to make you giggle, to pinning you down and using my finger to open your mouth. I have tried from every angle including holding you upside down and up over my head. But you are stubborn and obstinate. Every time I try you grab the camera, or shake your head, you put your tongue over them or just tip your head back and more often than not, you bite me. News flash baby, your definitely my little boy, where do you think you got the stubborn streak from? I persevered and today I managed to get not one but two photographs that showed both of your little fangs in all their glory. It was just a tiny little victory, but i’ll take it, even if you were having a complete meltdown in the playpen at the time!